If you havent checked out the extremely talented watercolor artist Ashleigh Pritchard, you’re missing out! You’ve probably met Ashleigh, the owner of CharmCat Creative, at one of our Vendor Socials – either in the DC/MD/VA area (aka the DMV, for those of us who dont know) or New York – because she’s been to our networking events up and down the east coast! Not only is Ashleigh incredibly talented, but she’s also caring and honest. We have been very lucky to work with her as one of our Participating Vendors and as a Bliss Community Member. At our recent business-building roundtable, Ashleigh shared SO much knowledge and much-needed information with us! She is the definition of supportive, generous, and encouraging. Yeah, we’re pretty darn lucky! Keep reading to find out some of the many reasons why! I have a different view on weddings than some more traditional vendors. I don’t buy into a lot of the rhetoric or etiquette rules that some people are very rigid about. I talk through the etiquette questions with my clients and let them decide what makes the most sense to them. Ashleigh creates hand-painted artwork with meaning – because you want something that’s a little more personal and a little less manufactured. We met Ashleigh Pritchard, the artist behind CharmCat Creative, at our first Vendor Social in New York. It seems like ages ago! We were impressed by the beautiful work she’d created – even more so when she told us that she’d hand-painted the gemstones herself! Specializing in watercolor wedding invitations, custom watercolor maps, everyday stationery, watercolor venue paintings, and art commissions, their creations are available worldwide! I love doing something unexpected! The best designs incorporate multiple contrasting ideas into one, because that’s what marriage is. It’s an opportunity to be truly creative, instead of copying what someone else did. That’s why I go more in-depth before I start designing anything. I like to get to know some fun facts about my clients that can help make their invitations totally unique because they’re the perfect fit for them. I never dreamed about my wedding growing up. When I got married, we had a very small budget and we did things our own way. Every couple has their own priorities and their own wants for their wedding and my philosophy is they shouldn’t feel pressured to spend money on something they don’t care about. CharmCat Creative is such an interesting business name! Tell us the story! My business is named after my sweet cats who love to “assist” me while I work! Every iteration of my logo has included art based on one of my cats. The current logo with the cat ears was inspired by our youngest kitty, Momo. She loves to stare up at me from the floor but I can only see her lopsided ears over the edge of the table… and it’s adorable! Why did you decide to start CharmCat Creative? I’ve always loved art. After school, I worked as a graphic designer for a corporate office, and I had difficulty finding motivation for some of the more monotonous assignments. I did a few designs on the side for personal projects, and a friend asked me to do her wedding invitations. I loved the creativity involved and I decided to make it a side business. I opened my Etsy shop in 2013 with a few basic designs. It wasn’t for a year or two that I started to incorporate painting into my invitation designs. In 2015, we moved and I took CharmCat full time. Now, I primarily sell painted designs and it feels like the perfect fit! Every artist is unique. I have my own style and technique, which means that everything I paint is uniquely me. My natural watercolor style is more refined and realistic because I’m a perfectionist! Follow CharmCat Creative’s beautiful work! 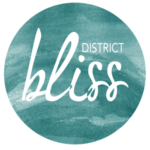 Would you like to join the District Bliss Community? Become a Member!